Love my knee lift for pivoting in machine applique! Also love my thread cutter. Hard choice—oh and my needle threader. Can I have three favorites? I have a Brother QC1000 and I still haven’t figured out how to use everything on it. I would have to say my very favorite is the needle threader. I just discovered the automatic pivot feature, and the lock on the screen both totally cool. Sewing in all directions. This is my first and probably last computerized machine so I just love it. Would not give up my vintage slant machines though for anything. Or my vintage Vikings. That ad is too funny! I like my walking foot and won’t ever NOT have one… and the needle up or down and the wonderful smooth stitching in the modern machines! I’ve been sewing over 50 years and I remember!!!! I NEEEEED three, too. It was a hard choice between the knee lift and needle down and my third choice would be the needle threader. If limited to one, on the one I use the most….at the moment, I’d say the positional needle feature…perfect ‘scant’ 1/4 inch every time! As long as it sews an even straight seam and does a zigzag, I’m happy. I have a wonderful Bernina that does everything but the dishes but those two stitches are all I really need to be happy. 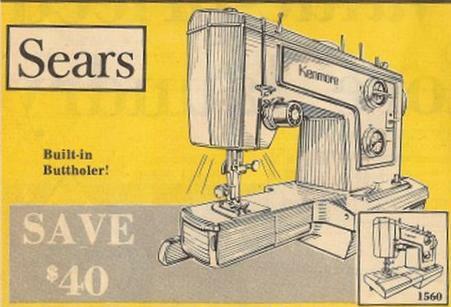 I also have my Kenmore from 35 years ago – its best feature is a single thread chain stitch I use for basting. I can’t live without the knee-lift. When I sew on other machines that right leg is always trying to lift the presser foot. I also love that teeny line at the 1/4″ on the throat plate, helps me keep the scant 1/4″ seam even with the 1/4″ foot. Martha says it all! Those are my very favorites, too! I love everything about my Bernina 440… haven’t found anything on it I don’t like! Never COULD make the needle threader work and finally lost it. It’s a Bernina 1090 – due for replacement as it has Berninaheimers and forgets how to sew straight every now and then, going into zigzag mode. Fixed once for a hefty price. Going to look for a new machine at the Houston show…. I HAVE one of those machines!!! I inherited it from my mother,who probably never sewed more than two or three sams on it, let alone a buttonhole. However, on my Pfaff 2058, hands down, it’s the needle down feature! The machine in this ad looks *exactly* like the Kenmore machine that I bought in the fall of 1977 — over 30 years ago! Mine didn’t have a built-in buttonholer, though — it had an attachment. Otherwise this could be the same machine — free-arm, the stitch dials, etc., are the same. I used that Kenmore for 13 years until my lust for a Bernina could not be contained! I couldn’t live without the zig zag stitch. I’m jealous of the new machines and features, but my 45 year old Singer Touch & Sew, with 21 cams (stitches) and a separate buttonholer, still works fine. So, at age 70, it will be my one and only sewing machine unless I get lucky and win one. I do have a surger that comes in very handy at times. So far it is my scant 1/4″ foot. Although… I also love the quietness and the newer technology as my other one was a “hotel – wife wanted – sale”. Love you Ami – keep it up! Needle up/down, blanket stitch, BSR! Loved the Sears ad! I went from a featherweight to a Baby Lock Espire – It has everything – I waited over 25 years for this. Low bobbin is magnificent, self threading,knee lift, needle down and ZIGZAG! This a great sewing machine. I have had one for 40 years and it works as good as it did the day my husband got it for me. The buttonholer is great. I used to have an old Singer (not featherweight, but black like them) and it had the button holder as an attachment. It was GREAT! You picked out a metal piece that was the size button hole you wanted and put it in the attachment and pressed on the pedal and it made the button hole all by itself. It was a shock when I got my 1st Bernina and had to guide the button hole myself. Okay, I, too, didn’t like having to choose just one feature. Since my Pfaff sewing machine purchase in 1988, I have become fond of the needle threader, the needle up/down button, the blinking light to let me know my bobbin is low and the built-in walking foot. I now own a new Bernina and it doesn’t let me know that the bobbin is low–that has become a real bummer for me. I didn’t realize how dependent I had become of that one feature. It’s easy to be spoiled. I also have to find and attach the walking foot now; however, I love the new stitches that my Bernina has. I guess there is no ONE sewing machine that would have everything that one person would like. I look forward to your “Through the Eyes of a Quilter”–great fun! I agree with V. Williams, it’s hard to find one machine with ALL the features you’d like to see. I bought my Pfaff because of the dropdown feed dogs, so i could free-motion quilt. But I’m still working up my courage for that….At least now I CAN, if I want to. It also has a built-in even feed foot, which is nice for straight-line quilting. The standard foot isn’t quite 1/4″, though, so that’s a bit of a problem. And it would be VERY nice to have an in-place bobbin winder like the old Singer Touch & Sew and a self-threading machine since my eyesight is so poor. I never got the knack of making buttonholes, so that would be nice, too! My brother was an All State Insurance salesman at Sears at the time. Every time he walked through the sewing machine department the day the ad came out, he asked to see the machine that was in the ad. Needless to say, the salesman in the sewing machine department was ready to throw him out before the day was over. He had to be nice to the customers, but the same policy didn’t apply to fellow salesmen! It is impossible to pick one favorite feature on my machine (s). I couldn’t live without the needle threaders, auto foot lifter, auto bobbin winding while sewing, auto thread cutter— just to name a few. I recently hurt my back and had to take an older light weight basic machine to my church’s Sewing for Missions all day sew-in because it was easier to carry. It didn’t have any of the above mentioned features and it really slowed me down. I felt like I was really back in the dark ages! It is amazing how spoiled we (I) have become. The term “good grief” can mean many things from an exasperating thing that has happened to the grief you have over the death of a loved one. When you turn around to ask your Mom a question, go ahead and ask it and don’t feel foolish for doing so. I did that for several days, but most of the time I wouldn’t finish the question as I would catch myself. Grief has many aspects and many different ways of expressing itself. Go for and just let it happen. Best thing you can do and seems like you are. During this time though, don’t forget to take care of yourself. I’ll bet building that snowman was great therapy for you. You and your family will remain in my prayers. Thank you so much for sharing what you are going through.